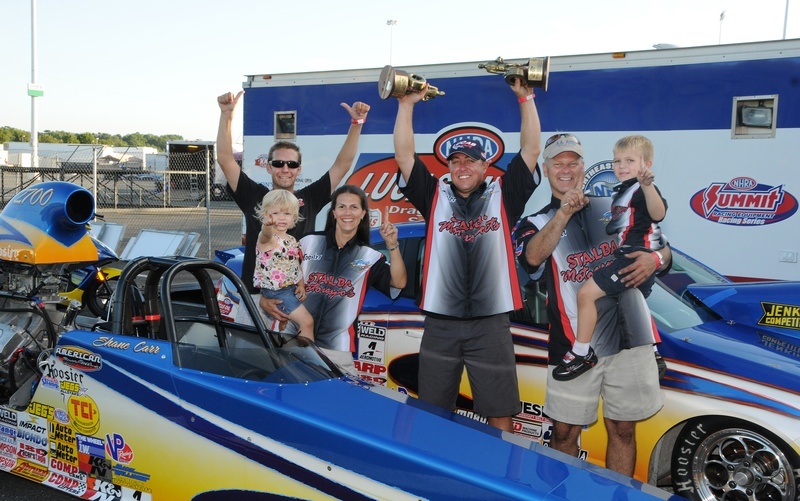 After reaching several National Event finals in Super Comp without fin ishing the deal, Tom Stalba finally got his first Super Comp National Event Wally at the Chicago Nationals in Joliet, Il. 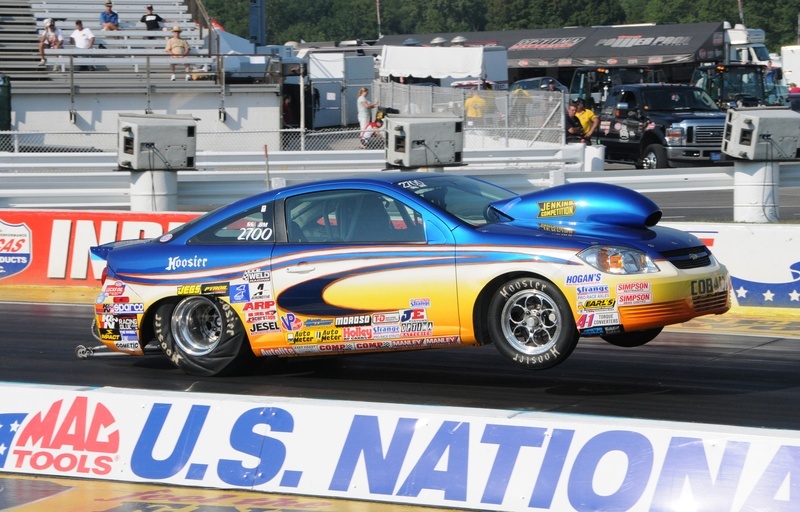 The Chicago Race was not originally on Tom's schedule, but after wife Karen clinched a berth in the Jeg's Allstars in Top Alcohol Dragster, Tom decided to head west to support her and her team. After a first round exit in Super Gas, Tom got his game together and was chopping down the tree and driving with a ton of confidence. Although Karen and most of the crew had to leave early sunday to get home, Tom's son Paul stayed with him and had a blast cheering his dad on. Paul joined dad in the winner's circle photos and on stage during interviews. Tom had a good feeling all day and wanted Paul to stay in case he got to the winner's circle. Tom would like to thank Charlie Yanetti for all of his help through the weekend and taking care of the cars. Also a big thank you to those sponsors who help make it possible for Tom to be out there racing each weekend. Thanks to Lucas Oil Products, Hoosier Tire, VP Race Fuels, ARP Racing Products, K&N Filters, Jeg's, Sunset Racecraft, Abruzzi Transmission, Biondo Racing Products, Weld Racing Wheels and Autometer. 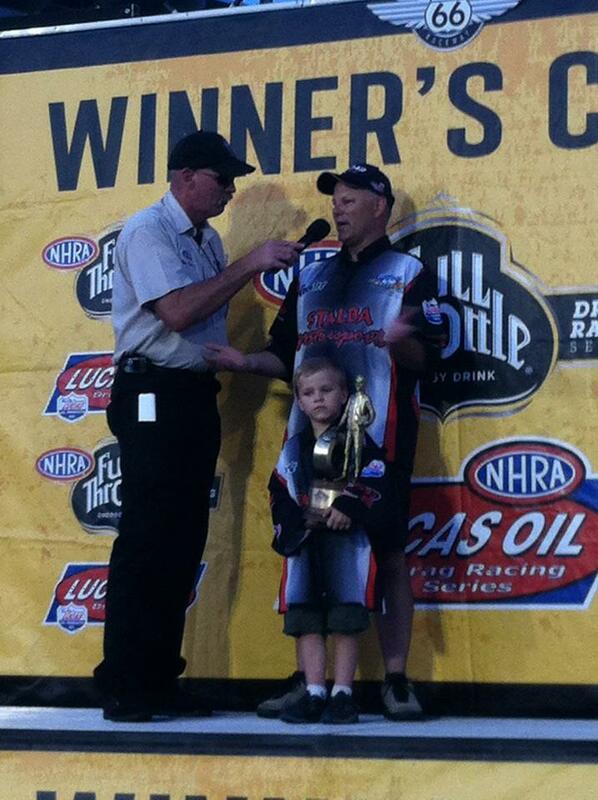 Three weekends, later...Tom Wins Super Gas at the Epping Division 1 Lucas Oil Drag Racing Series Points Race. 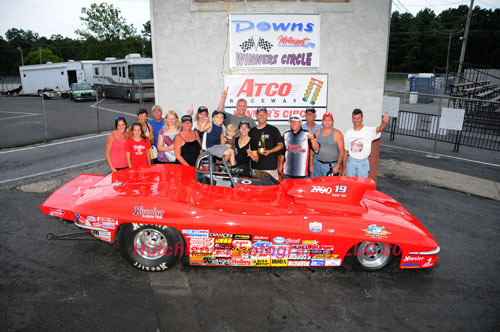 Next stop for Tom will be the Lucas Oil Points race at Atco Raceway the weekend of August 3-5, 2012. 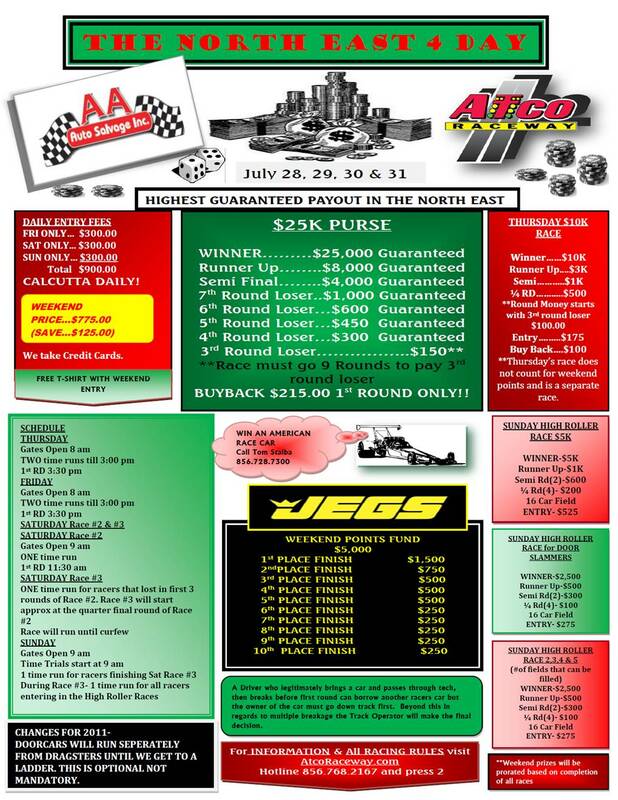 Then the team stays at Atco for the A.A. Auto Salvage Superbucks Summer Shootout at Atco. See below for flyer and information. Congratulations to Shane Carr On His U.S. Nationals Win in the Stalba Motorsports Chevy Cobalt!! 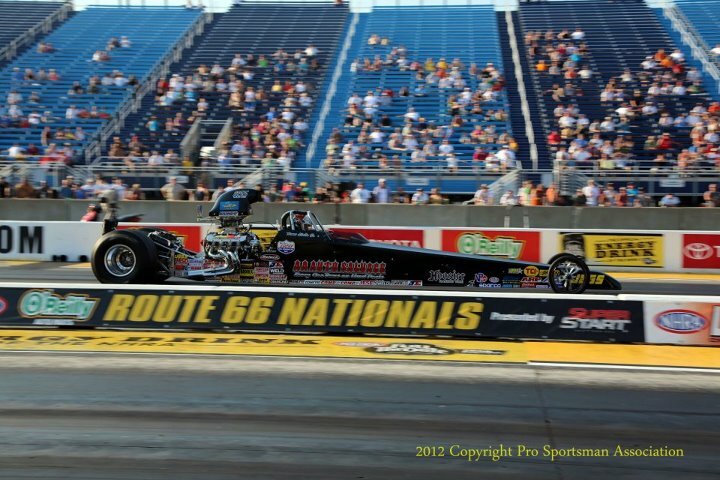 And on his Double up in Super Comp and Super Gas at the Cecil County Lucas Oil Divisional Race! Also congratulations to Tom on his Runner up in Super Gas! 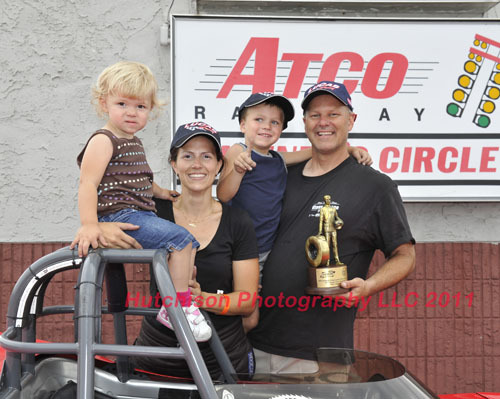 TOM STALBA WINS BACK TO BACK WEEKENDS AT ATCO RACEWAY! After a tough start to the year with broken motors and tough luck, Tom Stalba has been on a roll for the past couple weeks. He found his way back to the winner's circle first at the A.A. Auto Salvage/Jegs Superbucks weekend by winning a $10,000 Bracket Race. Tom beat teammate Shane Carr in the Semi-finals and then beat former teammate Steve Witherow in the final to pocket the big check! Then, one week later at the Lucas Oil Drag Racing Series Divison Points race at Atco Raceway, Tom won Super Gas in his 63 Corvette Roadster. 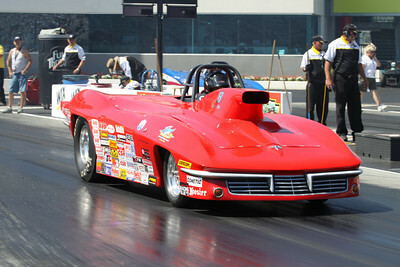 Tom faced a tough match with former Division Champ Mike Sawyer in Round 3 taking the win by .005 seconds. Round 4 had Tom Paired up with Matt Cooke and Tom won the double breakout race. by running closer to the 9.90 index. Tom raced Charlie Yanetti in the final and won on Charlie's 9.86 breakout. This win puts Tom in 2nd place in Division 2 in Super Gas. Next stop is Cecil County Marland for the 5th Division 1 Points race. 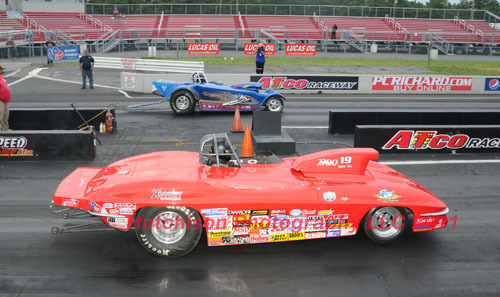 Comp Eliminator Fun in Lebanon Valley with the Luckiest Man in Drag Racing! Tom was back in action after a call from Vinny Barone to drive in the B/SR category of Competition Eliminator at the Lucas Oil Series Points race in Lebanon Valley New York. Testing thursday before the race, Tom was a bit worried about being lined up straight and if the car was going to get down the track. Each pass he made drifted hard to the left. Vinny and Charlie told him not to worry, they would get it working right. Tom seems to step in "Luck" when he gets out of bed in the morning, because although he qualified 11th and .479 seconds under the index, he had a first round bye run when his opponent, the #1 Qualifier, did not show up for first round! It was what they needed to make sure they made the right adjustments to the car. The car went straight down the track. Second round Tom faced former champ Frank Aragona. Tom was ready for it with a terrific light and took out the former champ which earned him a bye run into the semi-finals! In the semi's, the Barone roadster didn't quite have the performance, along with Tom being a bit too hard on the button in the car and was late. Overall, a pretty successful performance for his first time in someone else's car. The team looks to do some more testing with a new motor before the Epping Points race in a few weeks. See the schedule and come out and check us out! After a long rain delay Sunday, racing finally got underway. Having won the first three rounds of competition in the Super Gas Corvette on Saturday, Tommy was excited for 4th round and for his chances to win at this race again. He faced Tommy Phillips in round 4, and it was a heartbreaker. After Phillips lost to Shane in Super Comp, he came back against Tommy with a.013 light and went 8.900 to Tommy's .016 9.916 to take Tommy out. Then he just made it to the airport for his flight home. Tommy lost first round in Super Comp. The guys had a tough night fixing a bent valve on the Cobalt Super Stock car Shane is driving. Shane had only one time run and it wasn't a full pass, so he was lucky enough to have a bye run first round when his competitor broke. Shane then lost second round in the Cobalt. Shane will be in Norwalk running the Corvette this weekend and Tommy might be running a different class at Lebanon Valley, NY next weekend. Stay tuned for information on that!